The unknowns of natural dye keep me interested. I like to experiment with various dye changes to any of the current dyes on hand. It's a fun way to see various color ways that can be extracted from one material. Utilizing the avocado pit dye from my previous post; I placed a dash of iron into the pot along with the prepared dye and the avocado pits still present. This method is the "all on one" dye method. Once again I used fabric that had been pre- soaked in a soy mordant along with non-mordant-ed fabric of the same type to gain a wide range of colors from the same dye bath. 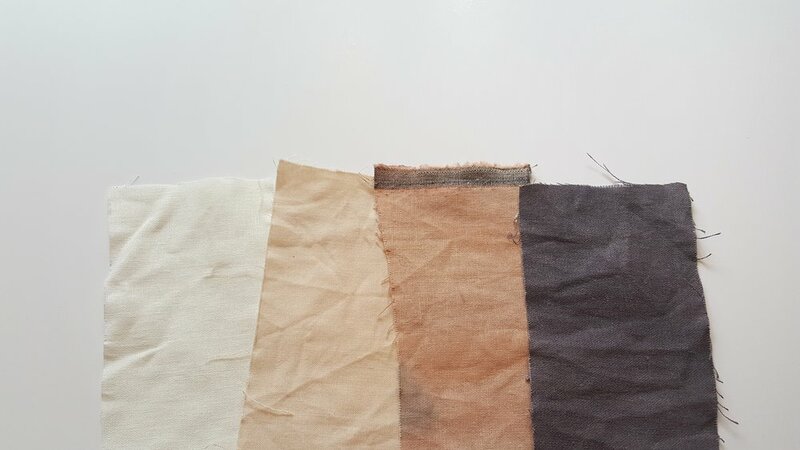 From left to right: 1. white cotton/ linen blend (no dye), 2. cotton/ linen blend with no mordant and avocado dye, 3. cotton/ linen blend with a soy mordant and an avocado dye, 4. cotton/ linen blend with a soy mordant, avocado dye and a dash of iron added to dye bath.